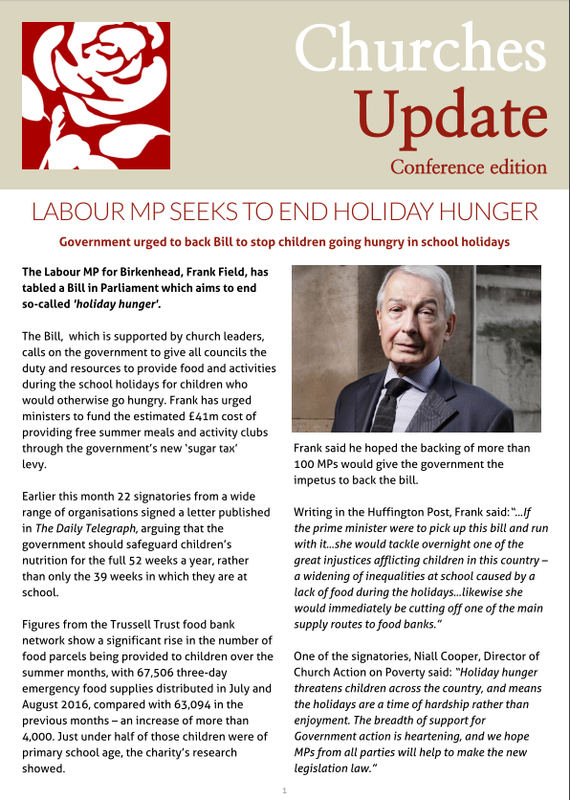 Latest edition of Churches Update out NOW! Sadiq Khan said the way some members of the Windrush generation had been treated amounted to a "stain on the nation's conscience". He wen on to say in an interview with Premier Radio: "There is no better example of the advocacy role of churches in our city and country than the fantastic role they've played helping the Windrush generation, their children and their descendants." Sadiq was speaking as he unveiled £20,000 to help affected families seek legal advice via the Windrush Justice Fund and apply via the Home Office Windrush scheme for citizenship. Church leaders joined Sadiq in urging the Government to ensure members of the Windrush generation are treated fairly. Last week, Stephen hosted the launch of a major report on faith, development and the Sustainable Development Goals in Parliament. ‘Keeping Faith in 2030: Religions and the Sustainable Development Goals’ was launched at the House of Commons at a meeting of the All-Party Parliamentary Group on Faith and Society, which Stephen chairs. The report’s authors, Emma Tomalin of Leeds University and Dr Jörg Haustein of SOAS, discussed its key themes together with Professor Carole Rakodi of the University of Birmingham and Emma Bridger from the United Society Partners in the Gospel. The report emphasises the importance of understanding religious dynamics and the role of faith communities and actors for sustainable development. It particularly explores how faith actors are interacting with the UN Sustainable Development Goals in practice. The panel highlighted the need to bring in faith actors as full development partners within sector conversations. They emphasised the need for religious literacy to be increased in NGOs and governments, both abroad and in the UK. They also recommended more investment to spread knowledge about the SDGs to local faith actors to enable them to fully participate in the sustainable development agenda. Labour leader, Jeremy Corbyn, has lent his support to Christians conference campaign and encouraged members to act on their '10 commandments'. The Labour Party Conference is currently taking place in Liverpool. Jeremy attended the annual church service on Sunday hosted by Christians on the Left and the Christian food bank charity the Trussel Trust, where the main theme was unity. The party leader also took a photo with the Christians on the Left campaign frame and tweeted that the service was: "Uplifting, positive, and beautiful service with Christians on the Left this morning, and I'm proud to endorse their #LoveYourCLP campaign. We must never pass by on the other side when people in our communities are in need." Speaking after the service, Tom Bray-Field of Christians on the Left, told Premier Radio, said: "This morning we had a fantastic prayer breakfast where we were able to have Stephen Timms MP and Marsha de Codova MP. We were praying, talking about their policies and praying for their work. "We just want to engage with members across the Labour party to kinda say 'The Church, or faith or Jesus is here and open to a conversation with you. And to say to the church that the Labour party is open to listen to the campaigns that we have, the areas of injustice and inequality that we campaign on,” he added. Tom Watson: "The bookies have won on FOBTs"
Stephen Timms: "Bishops can an must speak out"
Jeremy has delivered his best wishes to British Jews ahead of the Festival of Light. Jeremy said that Hanukah offers us a chance rededicate ourselves in the search for "...a more just, peaceful and equal world."